Kindle or iBooks US or UK, Kobo, Nook, Scribd, etc. Also in paperback, Red Squirrel Crime, Amazon, WHSmith (Travel) shops, Inpress. ‘A terrific book. Laws has crafted a very creepy, very haunting mystery tale. 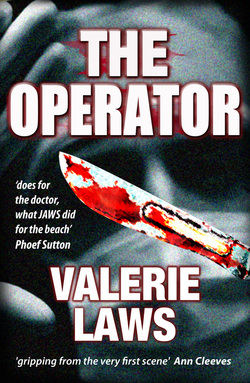 THE OPERATOR does for going to the doctor, what JAWS did for going to the beach. Trust me, you’ll never feel the same way about disrobing and lying on an examination table. You’re warned!’ Phoef Sutton, writer of TV’s Cheers, producer of Boston Legal, crime writer. For real-life location photos and more, see my Operator Pinterest board here. 'Now, this WILL hurt...’ In the second Erica Bruce and Will Bennett thriller a sadistic orthopaedic surgeon is bizarrely killed. Someone’s murdering surgeons, mutilating the bodies to mimic the operations they perform. This action-packed thriller reunites Erica Bruce, small but fierce alternative health therapist and journalist, with tall, dark, athletic Detective Inspector Will Bennett, full-on sceptic, 'helped' by outrageous charva Stacey. ‘Gripping from the very first scene.’ Ann Cleeves, award-winning author of TV’s ‘Vera’ and ‘Shetland’ novels. 'Intelligent, dark and shot through with sly comedy, Valerie Laws... consistently satisfies.' Alex Marwood, best-selling author of The Wicked Girls & The Killer Next Door. '...loads of twists and turns along the way, with the final one being a complete surprise. The climax of the book is bound to set pulses racing, as it races to the end at breakneck speed.’ Chris Longmuir, award-winning author of the Dundee Crime Series.